Optimize investigations. Conserve budgets (and resources). Work smarter. If you ask police chiefs around the country what their three biggest challenges are, there’s a good bet that the aforementioned is what the majority of them would list – at least from a departmental standpoint. What’s more is that these three challenges are all related to one another: For instance, the longer an investigation takes, the longer the necessary resources have to be allocated to the investigation. Discovering ways to work smarter and more efficiently can help accelerate the investigation timeline, thereby keeping budgets (and resources) better in check. When you’re conducting a police investigation, video evidence is obviously important. But it’s not exactly an efficient tool if you’re forced to sit behind a monitor and watch hours of footage looking for clues. That’s where a high-end video analytics system can help, as intelligent features allow hours of video to be condensed into minutes. Shortening video review time better allows law enforcement to identify people and places that can assist them in their investigation. With today’s intelligent systems, video can be filtered according to people, gender, vehicle types, animals and other more intricate features like bags and colors. Thanks to these features, certain video analytics systems have been credited with helping responders in New Orleans promptly solve more than 100 cases in less than a year since implementation. Similarly, detectives at the Hartford Police Department, have credited Video Content Analytics technology with helping them quickly ID a suspect’s vehicle in a fatal shooting based on eyewitness reports, allowing officers to quickly apprehend the suspect. 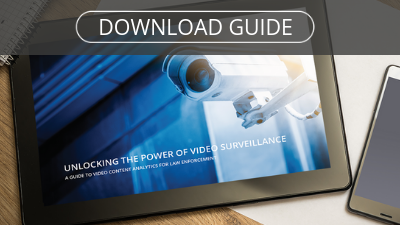 It’s estimated that advanced video systems permit officers to investigate incidents up to 10 times faster, which streamlines the process and conserves resources. Proactive policing: While many people think of law enforcement as reactive (i.e., responding to emergency calls), today’s systems offer smart alert features that allow police to work more proactively. Alerts can be set to provide real-time notifications of suspicious activity, such as loitering, jaywalking, fare evasion, people entering restricted areas and more. This enables officers to be more responsive and proactive as situations develop. Actionable insights: Today’s high-end video systems can also help detect trends, such as traffic flow and crowd traffic, to help assess any areas of concern or where safety may be jeopardized. This allows for actionable response, can help reduce incidents and can lead to a safer overall city. By understanding the typical events that take place in a city, police can be more strategic in responding to situations and emergencies, and improving local safety and quality of life. Because police officers have such an important job, it only makes sense for them to incorporate technologies that will allow them to work smarter and faster. Video analytics systems can do just that, while also keeping budgets and resources in check. It’s why a good city-wide video surveillance system and video analytics technology can be a big win for police departments.